... so we put a salon in yo retro game store so u can game in style while u get styled! 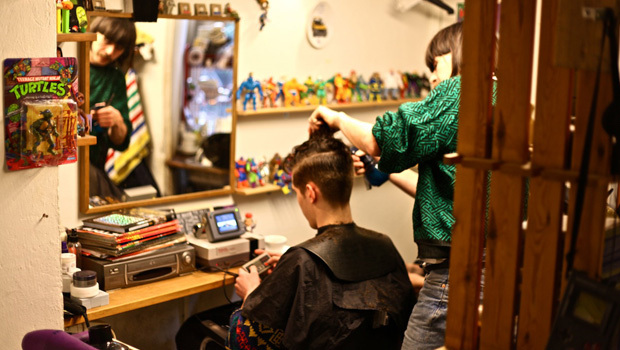 If you live in or plan on visiting Copenhagen, Denmark, you need to track down Ruben & Bobby, a hair studio that doubles as a retro toy and videogame shop. Store owner Bobby Ågren tried to find a way to combine all his passions into a single project, and the result has been as incredible as it's been bizarre. If you don't have cash on hand, you can exchange old goods for haircuts; there are even high score Tetris and Rad Racer competitions, and by beating the top score, you win discounts! All the cool gizmos in Bobby's store come from his personal collection, but sometimes, he finds it hard to sell his possessions. In those cases, he prices the items so high that no one will buy them. Once he grows tired of his toys, he'll reduce the prices to reasonable levels. Ballsy, but I love it! 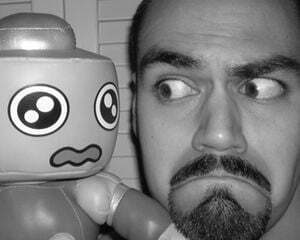 Ruben & Bobby is so insane that it's genius; the novelty alone is enough to put a smile on anyone's face. This just goes to show that, no matter how crazy your dream may seem, you should go for it anyway. Happiness and good fortune may be just around the corner!